Anza-Borrego is the largest state park and has tons of its own unique features. Mainly for 4WD, offroading, and dirt biking enthusiasts, we still had a lot of fun on foot and with 2WD. Fish Creek Is just a tiny portion of the park, but the wind caves are truly unique and offer an amazing view for sunset. Hint - Be sure to stop by The Slot on your way out, it's a quick and easy hike! Hint - If you camp at Fish Creek Primitive Campground nearby, it's free and there are fire rings and a very clean toilet. Since it began to warm up since winter, Ed, Jacquie and I were all ready for some outdoor adventure. We spontaneously decided on an overnight camping trip, and the only place nearby with appropriate weather in middle of winter was the desert! After doing some research, we went back and forth between possible hikes and campgrounds since the park was so big. We finally decided on Fish Creek Wash after reading Nolan's trip report. The wind caves seemed seemed like the perfect destination. We camped at Fish Creek Primitive campground, which has six well spaced out camp spots. There was plenty of soft sand to make a comfortable sleeping area, and our camp spot had a view of the vast desert before us. After setting up camp, we headed up Fish Creek Wash Road at around noon. We saw a surprising amount and variety of wildflowers given it being February and the lack rain this year. The Split Mountain Road was impressive, with tall, sheer cliffs rising above us on both sides. The rock layers were distinctly visible, and there were lots of areas of dried mud where the clay-like ground formed curved pieces. At least 15 trucks and dirt bikes passed us on our hike through, and we even saw two sedans, making us wish we had tried the sandy road in our Toyota Tacoma. Many portions of the road was deep, soft sand, so we had to keep zig zagging up the trail trying to stay on the firmest ground. When the wash began to open up, we saw lots of cars and people, signaling the popular wind caves trailhead was nearby. We saw a large group of 8 getting ready, and we hurried to pass them before they got started. The very visible trail climbed up pretty steeply the entire way, and it split off a couple times. 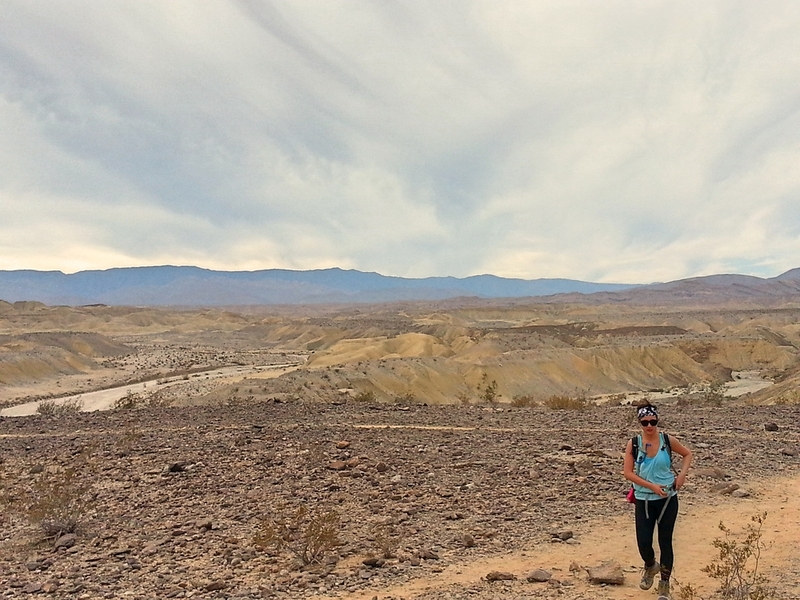 We always chose the one that seemed to keep climbing up, and we began to get an amazing view of the desert. All along the trail, it was difficult to imagine there being lots of caves nearby. As we came up over a hill, we finally saw the caves for the first time. It was quite bizarre looking, and we could see a couple people climbing and exploring the holes and passages. We were excited to get closer and start exploring! There were lots of holes of different sizes, and it was hard to imagine how old these caves were. Even though they are called wind caves, it wasn't very windy at the time. We found a cave near the top and climbed on top of it to have our traditional backpacking lunch of pizza with sundried tomatoes. Since it was cloudy, we were able to really sit there and enjoy the view for a little. After we finished, we headed up on a dirt path that climbed steeply above the caves. After taking in the view, we continued on the faint dirt path that descended and made its way all along a ridge. We saw lots of piles of poop pellets all along the ridge, which we believed were big horn sheep! Next we scrambled down the side of the ridge and ended up in a wash that we followed hoping it would lead us back to Split Mountain Wash Rd. When we neared the bottom of the wash, we realized we were at the top of a 17ft. dry waterfall! We could even see trucks driving on the road about 300 feet away, and there was no way to downclimb. We headed back where we came from, and climbed up one side of the wash on a steep slope. Unfortunately, when we reached the top we saw that the Wind Caves hiking trail was on the other side! We saw that on our side it kept climbing and wouldn't eventually lead back to the main road, so we had to climb all the back down to the wash and up the other wall to make it back to the main trail. It was slightly stressful since we were rushing to make it an overlook to watch the sunset, but it was fun finding our way. Continuing down the dirt trail, we broke off and found a cliff to watch the sunset at. After the clouds came in and covered the end of the sunset, we started our hike back down and back to our campsite. We made much quicker time because the air was much cooler and breatheable, and we were eager for dinner. As we hiked back, we watched the sky transform from pink to purple to a dark indigo. We were dead tired, and half wished that we could jump into a truck of one of the many trucks passing us on their way back. As we reached our camp spot, we quickly started a fire in the metal container and made some delicious udon soup. We then blew up our pads and laid out on the truck bed with our sleeping bags to watch the amazing stars above. It wasn't windy or cold early in the night, but the wind did wake me up several times in the middle of the night, and it was windy in the morning. We woke up as the sun was rising over the nearby hills, bathing the desert in golden light. We made some coffee and oatmeal as we packed up and headed out towards the main road. Even though most people drive through Split Mountain Road to reach the wind caves, the hike was still relatively easy and interesting with the wildflowers and rock formations. The Wind Caves themselves seem to be quite a gem in a desert, and if you're in the area, they are worth the visit. This was our first trip to Anza-Borrego, and we'll be adding it to our list of favorite desert destinations, along with Joshua Tree in Southern California.